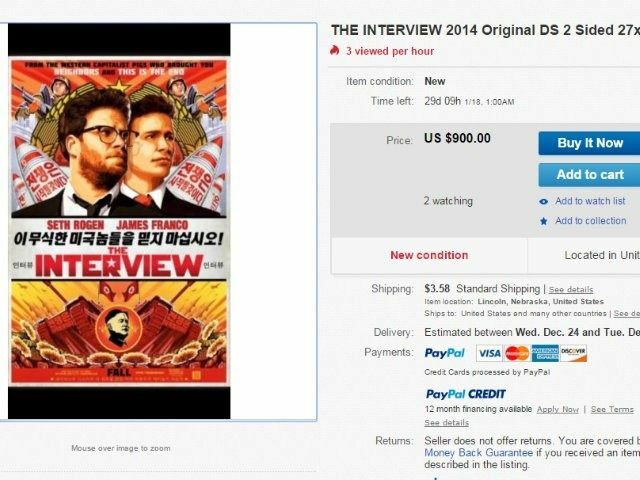 Movie posters of the recently pulled Sony Pictures film The Interview, starring Seth Rogen and James Franco, are currently hot sellers on eBay. Originals of the movie poster are selling for $1,000, while reproductions of the original poster can cost a bidder $300 to $350, depending on the size. The items are going fast on the auction site due to Sony’s decision not to release the film after hackers released private company emails and employees’ personal information, which embarrassed executives and famous actors alike. The hackers, known as the Guardians of Peace, made threats to theaters planning to show the film, a satirical comedy about two Americans asked to assassinate North Korean dictator Kim Jong Un, on Christmas day. FBI officials determined that North Korea is behind the Sony hack. “North Korea’s actions were intended to inflict significant harm on a U.S. business and suppress the right of American citizens to express themselves. Such acts of intimidation fall outside the bounds of acceptable state behavior,” a statement from the FBI to the AP said.